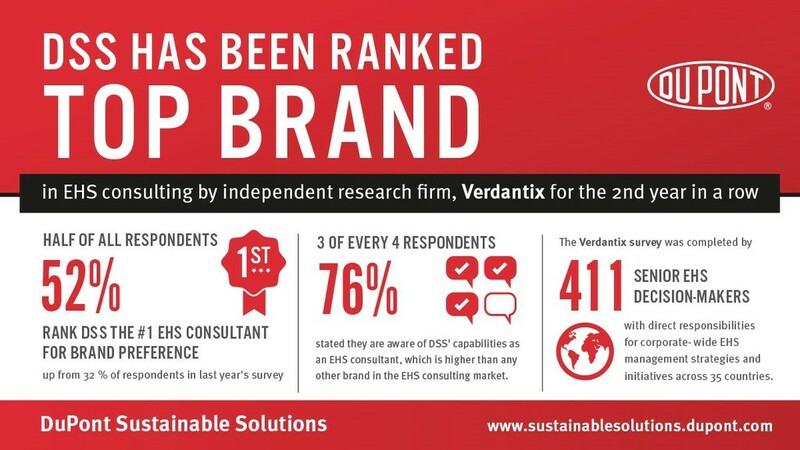 DuPont Sustainable Solutions (DSS) has been ranked as the top EHS (Environment, Health & Safety) consulting brand for the second consecutive year, according to a survey released in November by independent research and consulting firm Verdantix. The survey of more than 410 senior corporate EHS decision-makers from 35 countries gave DSS top marks for both preference and awareness. According to the Verdantix Global EHS Leaders Survey 2018: EHS Consulting Brands, half the respondents (52 percent) rank DSS the market leading consultant for brand preference, up from 32 per cent last year. Thirty-eight percent consider DSS’ capabilities “strong,” higher than any other EHS consultant in the market for the second year in a row.